For a while, if you were in trouble and no-one else could help, you could turn to The Equaliser, who would turn up and resolve your problems. 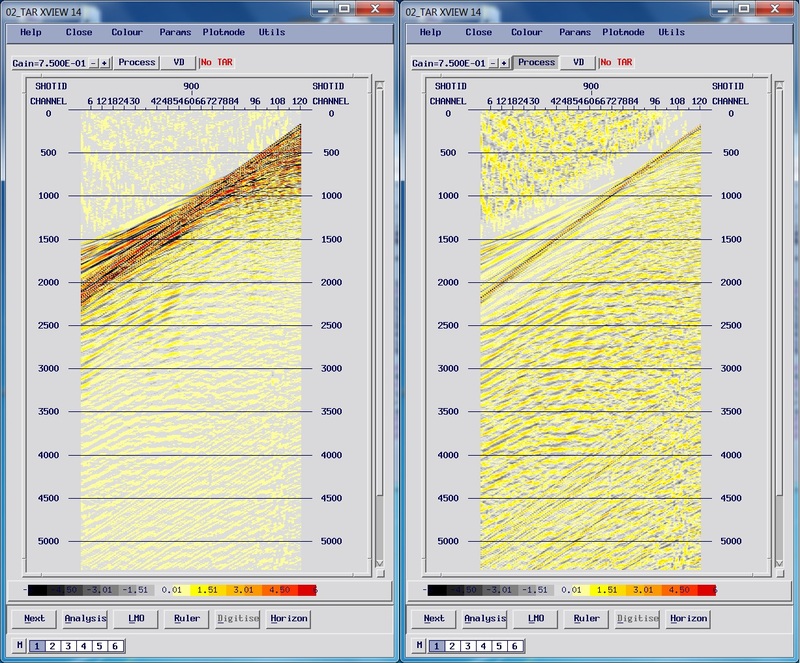 In seismic processing, our problems are often amplitude related. 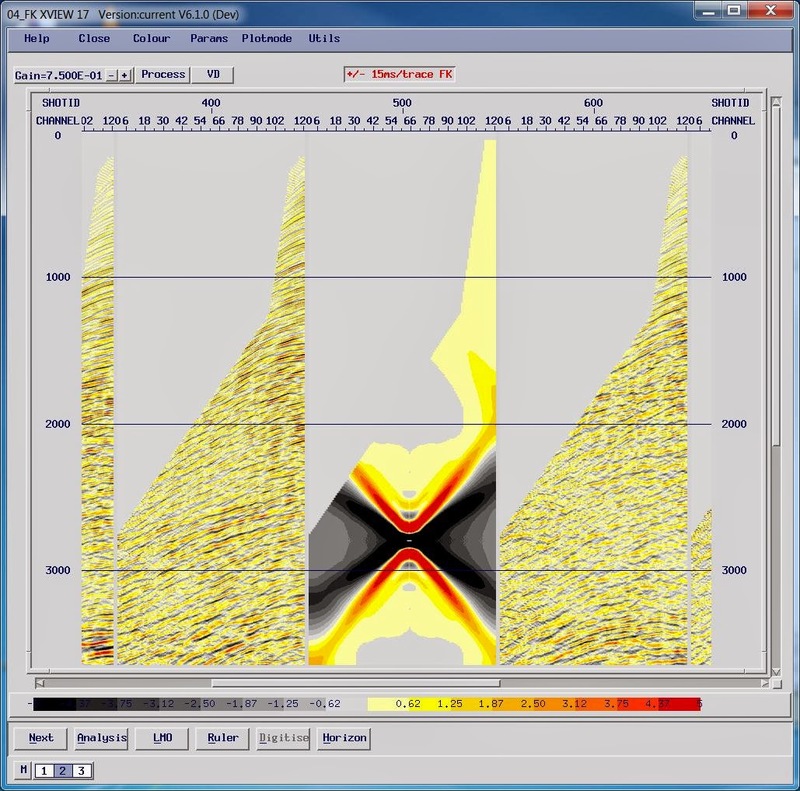 High amplitudes on a screen display or plot can make it difficult to see fine detail elsewhere, even after we have applied amplitude recovery methods such as linear gain and spherical divergence corrections. At this point, we can call on our very own Equaliser: the Automatic Gain Control or AGC. An AGC balances out amplitudes across a whole trace, using a sliding window. An average value for the amplitude is calculated inside the window, and then a scale factor calculated to normalise this to a fixed value, usually 1.0. The window then slides down by a sample and the process is repeated. The window (or gate) is typically 250-500ms in length; short gates have a more pronounced effect. This is an exceptionally “brute force” approach but it is very effective – we used it a lot on hard-copy wiggle-trace plots, which were particularly difficult to scale properly. A marine shot record, with no AGC (left) and AGC applied (right). AGC is great when you haven’t got the time to scale a plot properly – just drop it on the data and you can see everything! AGC will “blow up” the noise in the water column (or above the direct/refracted arrivals on land data) which can surprise the inexperienced. It can be a good idea to have muted this off before showing the displays to clients. That said, a simple AGC has some downsides. Yes it is fast to calculate, but uses the mean value as the basis for the average amplitude. As a result you get a “scaling shadow” just above and just below a strong event. You can get around this by using a “robust” (or median) AGC – it takes a bit longer to run but by using the median value instead of the mean, it has fewer issues. 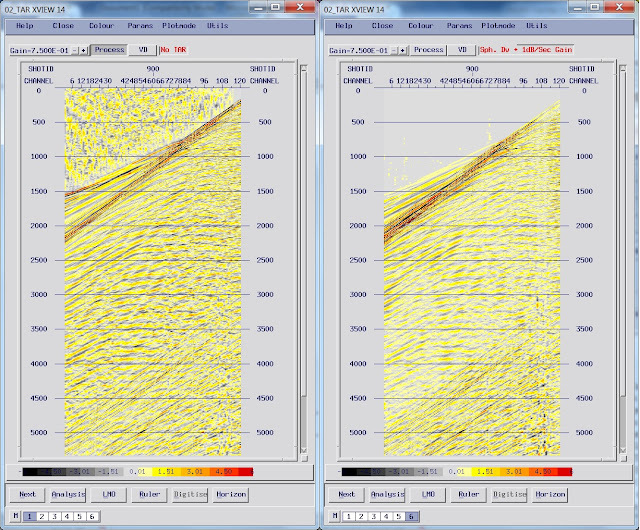 Normal AGC (left) compared to a robust AGC (right) – the robust AGC doesn’t have the scaling shadows around the strong amplitude refracted and direct arrival events. Of course sometimes the AGC scaling shadow can actually be useful – it makes it easier to pick out refractions on noisy land data for example. In general, AGC is cheap and nasty as a gain recovery method. 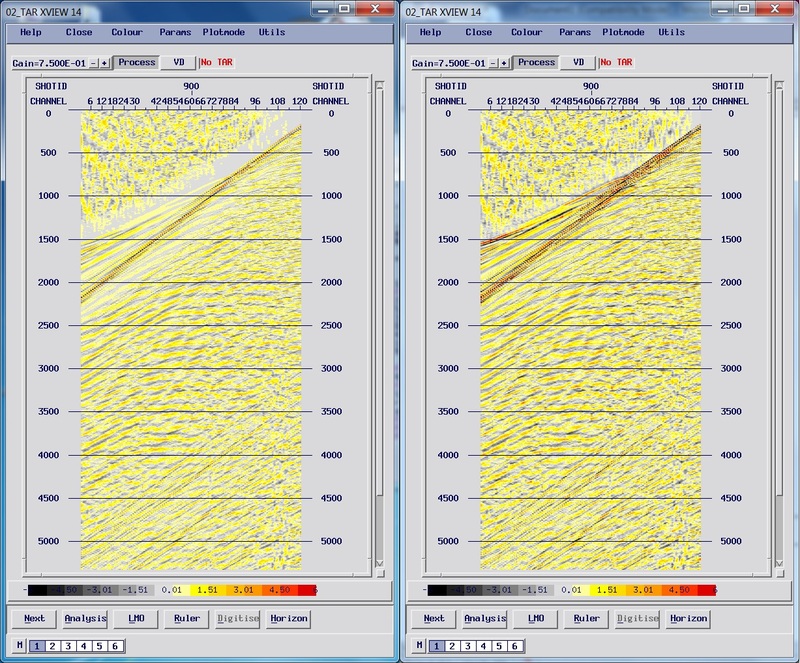 While it lets us see structure clearly, the subtlety of amplitude variation is lost. With interpretation workstations allowing you to toggle an AGC on or off, and the rise of quantitative interpretation methods like AVO and inversion, AGC has fallen out of favour. It is more common now to use a combination of spherical divergence correction and linear gains to recover amplitudes more correctly. The former corrects for the spreading of the source wavefield with time, and the latter for losses arising from things like scattering, inelasticity, as well as mode conversion of P-waves into S-waves or refractions. 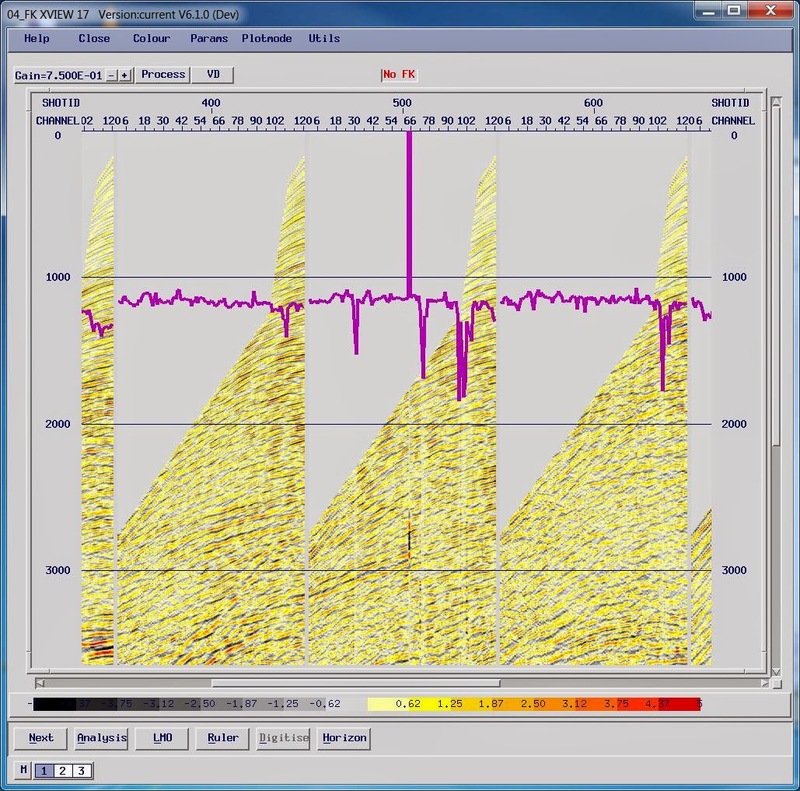 These “true amplitude recovery” processes are usually tested early on in a processing sequence (often in combination) and retain much of the “amplitude character” of a trace that AGC can swamp. 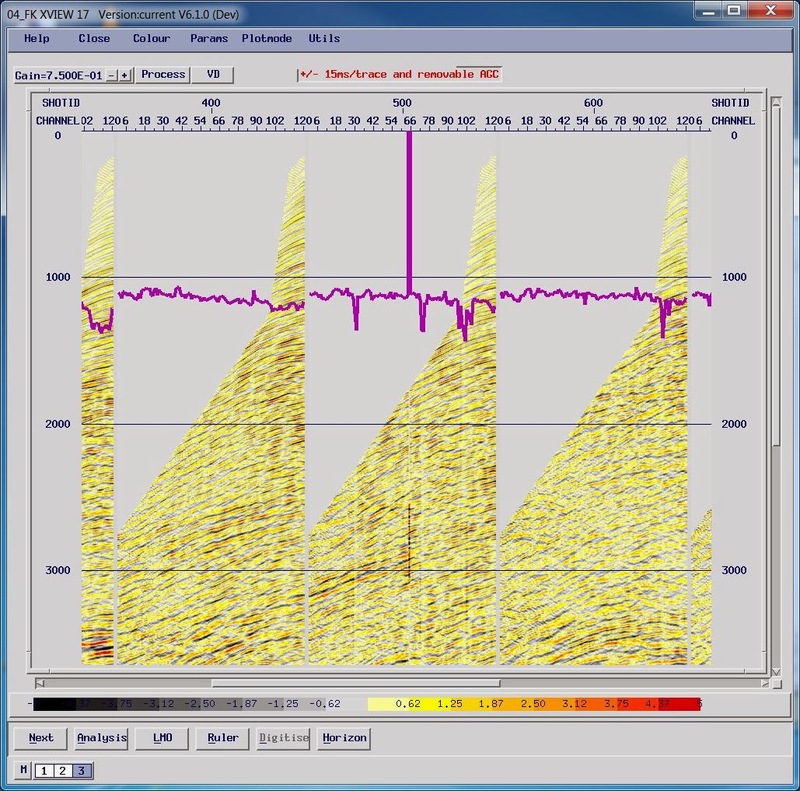 In addition we can also select parameters for these gain recovery techniques based on quantitative analysis – such as amplitude decay curves or even in a statistically robust way using surface-consistent scaling techniques, which helps with their accuracy. Robust AGC (left) compared to amplitude recovery (right); in this case a T2 spherical divergence correction coupled with a 1 dB/second linear gain function. However, AGC should not be neglected, as it remains a useful trick in the processors toolbox for managing difficult datasets with big amplitude variations. A few shot records, one of which has a nasty surprise in the middle! As you can see from the RMS amplitude plots, one of the traces has extreme values; this doesn’t show all that well on the seismic display, and you might miss it. Apply an FK filter, however, and you get a nasty result! The same shots with an FK filter applied; the extreme amplitudes have given us an impulse response function of the FK filter, spreading the high amplitude noise across the whole shot. The dipping noise has gone from the dataset, but the high amplitudes of a single trace have produced an impulse response function for the FK filter that has contaminated the whole shot. It is an extreme example, but highlights the issue. We can combat this using a removable AGC. This is like a regular AGC except the scalar applied to each window is stored; we have one scalar value for each sample so this can be time consuming. We can then “back off” the AGC, recovering the original amplitudes by removing the scalar values one gate window at a time. 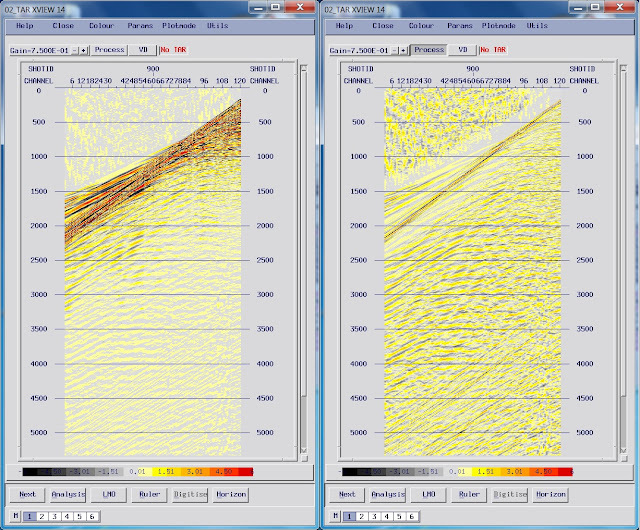 The same shots with an FK filter applied with a ”removable AGC wrap” – that is an AGC before the FK filter which stores the gate scalars, and an “un-AGC” afterwards to recover the original amplitudes. This “AGC” wrap approach can save a lot of time when managing a large number of spikes, or when data has big variations in amplitude that cannot be compensated for easily in other ways. It is also reasonably “AVO friendly” in that the amplitudes are well preserved. While this example is extreme, the AGC wrap “equaliser” can be a good way to deal with noisy land datasets when you need to apply FK or Tau-P domain processes, and is well worth remembering as an alternative to time-consuming despikes or geologically driven scaling. It doesn’t have as good theme music as the 80’s original though.